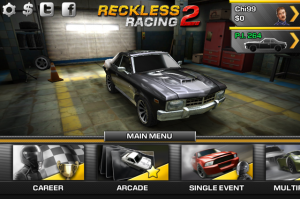 There is a reason the original Reckless Racing received an Editor's Choice nod from 148Apps when it first debuted at the end of 2010. It was pure, feel-like-a-kid-again racing with slick controls and fast cars. 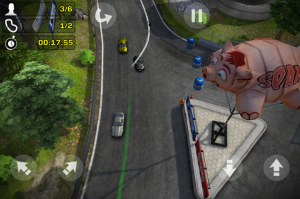 Reckless Racing 2 is even better. This third-person racer now has more tracks, more modes and more excitement. I'm sure from a developer's standpoint racing games with their quick movements are probably one of the most difficult genres to develop. Not only do they have to dial in hairpin turns, they also have to make the driver feel like every turn they make is on a dime. Lag is a racer's worst enemy. The silky smooth physics of Reckless Racing 2 are phenomenal. The car reacts to every touch in an instance without lagging, jigging or chopping along. It's like butter. The amount of gameplay is impressive with 24 routes of dirt and street options as well as several modes to choose from, including career, arcade, single, and multiplayer. While I tested out all thoroughly, I'd have to say I got the most out of career and multiplayer. Career offered a ton of racing, points, achievements and leaderboard runs while multiplayer gave me the bragging rights (not all the time) of taking pinks against human racers. The one negative I noticed was that the other opponents ghosted in and out and there was a light chop every once in a while. However, it's most likely do to varying reception issues. One of the best additions to the newer version is the larger and better selection vehicles and upgrades one can choose from, which is 18 to be exact. They all look very similar to some of the best American muscle and high-end import cars. The upgrades, which can be purchased in the garage, are the usual speed, handling and acceleration options. Some tournaments have specific upgrade requirements and will not let the player race otherwise. Reckless Racing 2 improves on all of the original game's features and adds several more goodies such as career mode and car customization. This all combines to make it the best "rubbin's racin'" game on the App Store.